Low double sided storage unit with six pigeonholes. For libary use. Signed with letters "D.J.199"
File Rack Jeanneret designed together with Le Corbusier a new capital in Chandigarh. In the 1950es they created a vision of new living, where modernity and tradition came together. The spririt of India and modernity of Europe created a world, where archaic and modernity get an unity. Le Corbusier left soon the project and was looking for new chalanges. 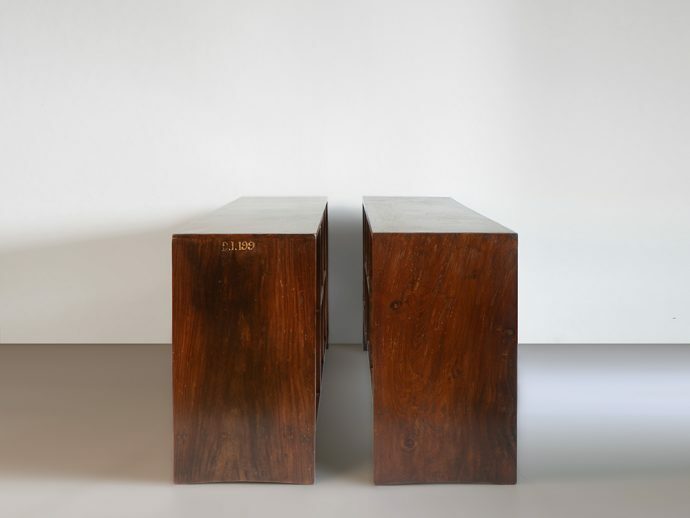 Pierre Jeanneret continued to live in Chandiarh and has got professor on the architecture faculty there. There he lived for 15 years, worked on the city and developed a big amoint of great design pieces. File Rack. Pierre Jeanneret works and shelves and furniture. 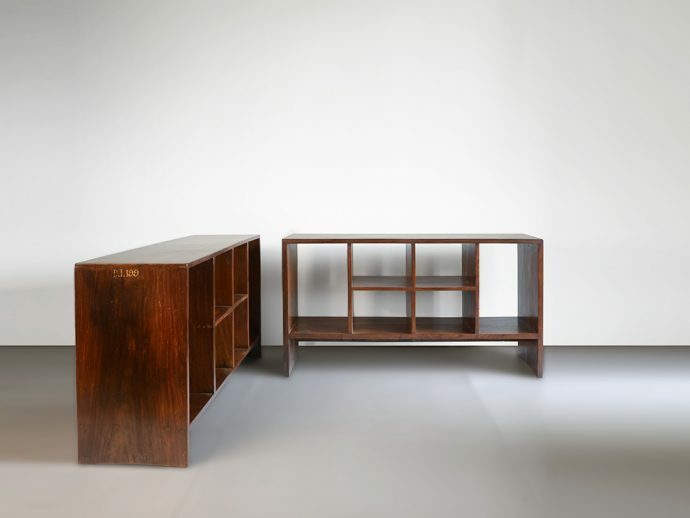 He knows how to create furniture with Le Corbusier teak furniture and Sisso furniture. Very rare and valuable objects. Issued in our P! Gallery in Zurich. Offered with 6 holes and a rare color. The piece is offered in Berlin and Stuttgart. Rare furniture and top design. The design furniture is rarely pieces of art and such. The work and Le Corbusier know JEanneret to make an asset. This eats well and museums buy the furniture all off. Bookcases are rare and we sell these authentic furniture. The art from Chandigarh is offered on Wright20, where reality is rarely good. A funny story of 1960 knows where India is. Indian rarity and collector's item. A value creation for banks and colors, where Mumbai creates collectors' pieces. Thus water from Gandhi and Ahmedabad becomes a Cobusier story. Berlin air and rare stones, Committee chair matching the carpets. Interior architecture and architecture for the residential areas. Living is important and that is how it should be. An antiques should revive here.